Leading rabbis and politicians take part in sheva brachot of Chief Rabbi Yosef's youngest daughter, and recall Rabbi Ovadia Yosef. Religious Zionist and haredi rabbis, alongside politicians, took part on Thursday night in the sheva brachot wedding blessings for Sephardic Chief Rabbi Yitzhak Yosef's youngest daughter, following her wedding at Jerusalem's Binyanei Hauma. The sheva brachot was held at the Prima Kings Hotel in the capital, where Rabbi Yosef praised Prime Minister Binyamin Netayahu for his work in strengthening the world of Torah. "We see that there is a large blossoming of Torah institutions throughout the land. To you, Prime Minister, there is a large part in that because you give the strength and the resources for it," said the rabbi. The Rishon Letzion also praised Netanyahu's wife Sara for her actions in the endowment of Torah studies, which she inherited from her father Prof. Shmuel Ben-Artzi, and he blessed her that those taking aim at her in court cases would not succeed. Speaking about his father former Chief Rabbi Ovadia Yosef, the current Chief Rabbi said, "my father Maran very much honored Netanyahu. The Prime Minister told me once that he is very sorry that he didn't bring his son to Maran." Netanyahu, for his part, congratulated the young couple and said, "my last moments in Maran Rabbi Ovadia Yosef's room were among the most moving moments in my life. These are moments I will not forget." Addressing Rabbi Yosef, Netanyahu said, "I indeed am sorry that my son did not manage to come to your holy father. My son currently is in the army but soon he will come to be blessed by you, Rishon Letzion." 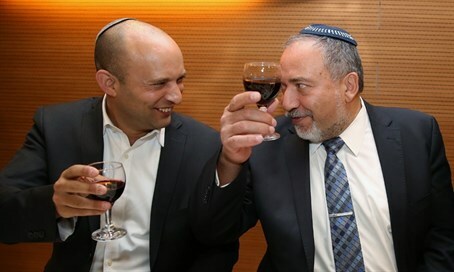 Interior Minister Aryeh Deri, chairperson of the Shas party which Rabbi Ovadia Yosef was the spiritual leader of, also spoke at the event and praised Netanyahu. "We sat in the Prime Minister's house when the government was established and we thought about how to memorialize the heritage of Maran zt''l," said Deri. "The Prime Minister pounded on the table and said, 'Rabbi Ovadia belongs to the entire nation of Israel. I want something big and powerful in Jerusalem,' and that's how it will be with God's help," he added, referring to Netanyahu's "Jerusalem Jubilee" plan. Earlier in the event, former President Shimon Peres arrived to take part, and in his speech talked about his dealings with Rabbi Ovadia Yosef. "Like Moshe Rabbeinu (Moses) he was a shepherd of Israel. He spoke in the language of the people because he felt its pain. His wisdom never left him for a moment. The blood of Maran flows in the blood of his son Rabbi Yitzhak Yosef, the parth of Rabbi Yitzhak Yosef is a continuation of the path of his father," said Peres. Various leading figures took part in the sheva brachot, including former Ashkenazic Chief Rabbi Yisrael Meir Lau, his son the current Ashkenazic Chief Rabbi David Lau, Rabbi Chaim Druckman, Rabbi Ya'akov Shapira, Rabbi Shmuel Rabinowitz and Rabbi Aryeh Stern. Ministers Avigdor Liberman, Ya'akov Litzman, Yisrael Katz, Yariv Levin, Naftali Bennett, and Gila Gamliel, Jerusalem Mayor Nir Barkat, MKs Yisrael Eichler, Eliezer Mozes, Yoav Ben-Tzur, Yigal Guetta, Meir Parush and many more also participated in the event.